I haven't been posting much lately, other than my lists of new openings. You know how it is - life gets busy, and it's much easier to just send out a quick tweet or two. Once you've procrastinated enough, all those blog ideas you had don't really seem so relevant anymore. Anyway, to add some pictorial content back to my blog, here are some restaurant signs I've seen around the place. I find it pretty amusing how long some of them have lasted for, since these Chinese restaurants closed years ago! Ding How is probably the restaurant I remember the most of the three in this list, since I actually went there with friends using an Entertainment Book voucher, rather than just having a vague childhood memory. I'm not too sure when that was, but I found a review from 2007 online, and it was still around for the St Patrick's Square opening celebrations in 2009. The upstairs space is now home to the Heaven Scent Food Co. It's a great place for pies and salads, but from the red sign outside their windows on the side that's away from the square (overhanging Albert Street), you could easily mistake it for the Chinese restaurant which no longer exists! No Ding How Chinese restaurant here, despite appearances (picture from September 2016). New Orient in the Strand Arcade was Auckland's oldest Chinese restaurant*, and closed in 2010 after nearly 40 years in business. Originally "The Orient", it was sold in 1978 and renamed "New Orient." I don't remember much other than going down the stairs to the basement restaurant, but apparently they had a full Chinese buffet for lunch or dinner which was popular. New Orient sign outside the Stand Arcade (picture from September 2016). New Orient sign inside Strand Arcade (picture from December 2016). Unlike the previous two examples, the signage for Palace Restaurant is just fading paint on the side of a wall now. You have to stand across the road to see it, otherwise the awning over the footpath gets in the way, and until recently, it was covered up by advertisements. I don't have any recollection of this restaurant at all, though the business apparently existed from 1993 to 2000. The company listing shows it was on level 10 of the red pagoda tower known as Choice Plaza, which used to be called the Orient Towers. The distinctive building was commisioned by Mangere's Chan family in 1988, and designed by Auckland architect Ron Sang. Palace Restaurant painted on wall (picture from October 2016). 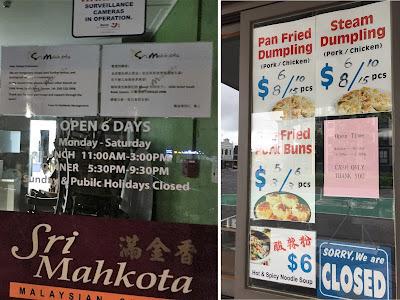 Sri Makhota is Malaysian restaurant whose original East Tamaki branch was purchased by the Chin family (founder of the Hansan Vietnamese chain) in 2008. While that restaurant and its sister in Epsom are still around, the city branch, which opened in 2010 on Upper Symonds Street, closed quietly last year, despite a renovation in 2014. 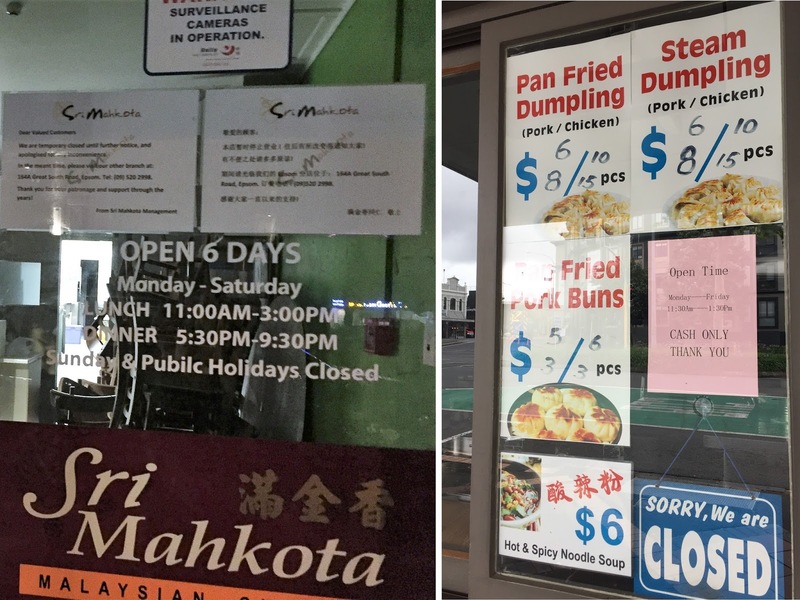 Closed sign (April 2016) and menu from Nice Dumplings (November 2016) at the same location. You could be forgiven for thinking Sri Makhota still has a third restaurant though, since the city branch is still listed on their website. And if you go around the corner and peer down Stable Lane, you will still see the restaurant sign hanging out the back. Sri Makhota sign in Stable Lane (picture from November 2016). What is it about Chinese restaurant signs that give some of then such an extended life span? Do you have some other examples I have missed?